Facing the team it will play on Monday night in Reno in the first round of the Big Sky Conference tournament, Montana shot 44 percent against the league’s best defensive team and defeated Idaho State 68-53 at Dahlberg Arena on Friday night. The Lady Griz (7-22, 4-14 BSC), who will be the tournament’s No. 11 seed, will play the No. 6 Bengals (16-13, 10-8 BSC) at 9 p.m. (MT) at the Reno Events Center. The winner will face No. 3 Northern Colorado at the same time on Wednesday night. 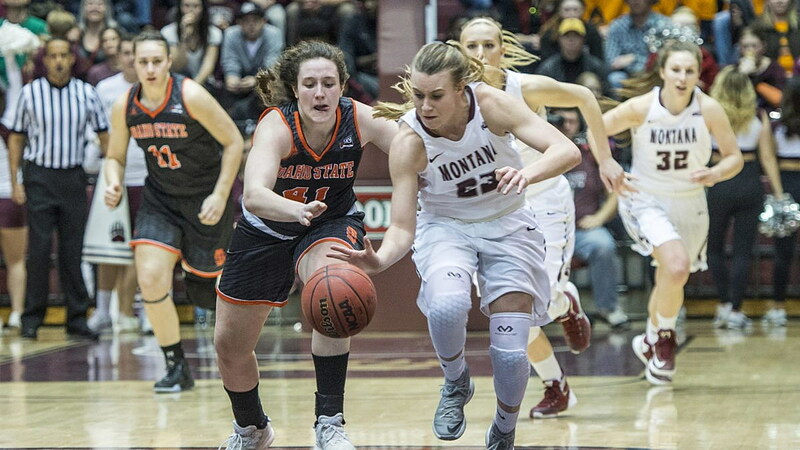 When Montana and Idaho State met in Pocatello back on Dec. 29, the Lady Griz were no match for the Bengals, who won 61-43 in a game that wasn’t even that close. On Friday night, Montana showed just how far it’s come the last nine weeks. McKenzie Johnston was the best player on the floor, the Lady Griz had balanced scoring from both starters and bench players, and Montana turned the ball over just 10 times while shooting better than 44 percent for the second straight game. “All the things we’ve gone through this year, from the start of it until now, it was worth it to experience how we’re feeling tonight,” said coach Shannon Schweyen. Montana has not won a game away from Missoula this season and only in three of those 14 games was the final margin closer than 10 points, but with the madness that comes with the flip of the calendar to March, who knows what next week could bring. “Idaho State is a good team, and it will be a new slate when we get down to Reno. We get a day or two to regroup, then we’re right back at it,” said Schweyen. If defense is what wins the day at tournament time, Montana should feel good about the way its play on the floor is trending. In Wednesday’s 71-46 win over Weber State, the Lady Griz held the Wildcats to 27.6 percent shooting, a season-best effort for Montana. Two nights later, Idaho State was held to 32.7 percent shooting and forced into 19 turnovers. “The girls played some big-time defense tonight. They were really into it,” said Schweyen. After the teams played to a 13-13 tie after one quarter, Montana held Idaho State to 2-of-14 shooting and just six points in the second to build a 25-19 halftime lead. From there it was Montana’s offense that came through to hold off Idaho State’s pushes to get back into the game. Johnston scored at the end of the third quarter to extend Montana’s lead to 41-34 entering the fourth quarter. In the final period, Mekayla Isaak hit a big shot on the left baseline, and Hailey Nicholson rolled in a soft jumper from the elbow, both coming when Montana needed someone to step up. Then the Big Sky’s worst free throw shooting team had to prove it at the line. And it did, going 16 for 18 for the quarter, 22 for 28 for the game. Johnston finished with 20 points, Madi Schoening had 11, and Sierra Anderson provided another spark off the bench with nine points on 4-of-6 shooting. Long gone are the days when it was Taylor Goligoski or nothing. Montana is 4-3 in its last seven games, with Goligoski averaging just 7.4 points. “It’s nice when you’re getting something from everybody and not just relying on one person. At the beginning of the season, Taylor was the only one scoring for us,” said Schweyen. It’s been Johnston’s emergence as a senior in a redshirt freshman’s body that’s been the biggest difference. Her numbers since late January are All-Big Sky-worthy. Friday was no different. She scored 20 points on 7-of-11 shooting, was perfect in six trips to the line and added six rebounds and five assists. She played 39 minutes and didn’t turn it over once. If a team defends and has great play from its point guard, good things tend to happen. And they have been for a while now. The victory made a winner of Rachel Staudacher on her Senior Night. She went out with four points, seven rebounds, three assists and three steals. Grace Kenyon and Bianca Thacker both had 10 points for Idaho State. Saylair Grandon, the team’s top scorer who hadn’t played in a game in nearly a month, scored seven points off the bench. Monday will open with No. 8 Weber State playing No. 9 Sacramento State in Reno. No. 5 Idaho will face No. 12 Southern Utah in another repeat matchup from Friday night, and No. 7 Portland State will play No. 10 Northern Arizona. No. 1 Montana State, which clinched a share of the regular-season championship with North Dakota after the Bobcats won at home against Weber State on Friday and the Fighting Hawks lost at Portland State, No. 2 UND, No. 3 Northern Colorado and No. 4 Eastern Washington await Monday’s winners.